If you’ve had your head in a bucket for the past 10 years, three things may have happened. You’ll be sick of the smell of KFC, you may have acquired the shredding skills of Buckethead himself and you will not have encountered mention of Ableton’s DJ-friendly, muzo-matey digital audio workstation (DAW) Live. You may also be unaware of the fact that Live has cranked itself up to v8.2.6 and, for a limited period, there’s a FREEBIE worth €79 going FREE, at NO COST and FOR NOWT. Fans of retro synthesizers - Moogs, ARPs, Korgs and more - steel thyselves for a bargain. Provided you’re a registered Live/Suite 8 user, that is. Meantime, for the bucket-bonce afflicted, let's rapidly recap this DAW's past decade. Live burst into life in October 2001 and was initially perceived as a tool enabling those who’d become bored playing other people’s records (ie, DJs) to realize aspirations of producing their own material. 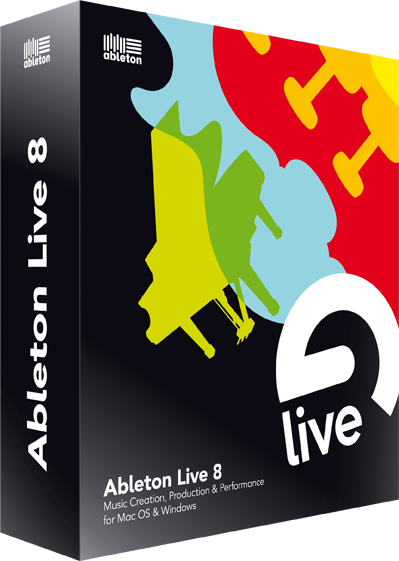 Live’s main selling point was the ease with which loops could be imported and warped to match the tempo and pitch of a project, then triggered at appropriate points for on-the-fly creation of new tunes (or ‘toonz’, even). Now it's time to go against a prime diktat from the Big Book of Product Review Lore and say, way prior to the closing paragraph of the piece: "Buy it now.” This is for two good reasons, the first of which is timing - here’s where the asterisk in this post’s heading becomes relevant. Looks tasty, no? There's been the odd whinge from the online community, such as the ongoing inability to plonk Arrange and Session views on separate screens for those monied types with dual-display systems. And a pundit from musicradar.com points out that Live still has a propensity for incorrectly identifying the first beat of a song. 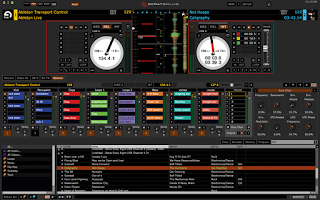 That said, the new Groove Engine, by which rhythms can be quantised to a wealth of groove maps, is welcomed with much slavering, as are improvements to Live's handling of MIDI data, substantial workflow enhancements and additional plugins. Of the latter, the Looper is praised with great praise, it being a phrase sampler toting auto loop calculation and retriggering. Pretty handy when using Live live. 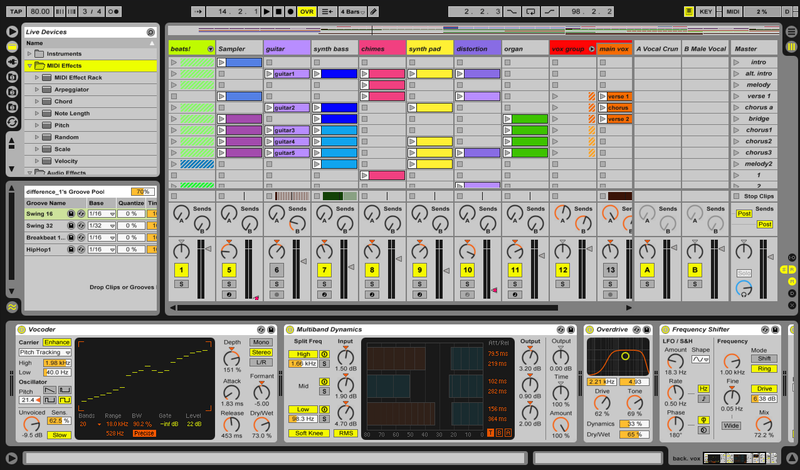 So, since Live 8’s launch, what tinkering has Ableton been about? There’s the usual wealth of bug-fixes and tiny tweaks, but the development team’s more significant C++ pounding sessions have brought forth some neat improvements and feature changes. 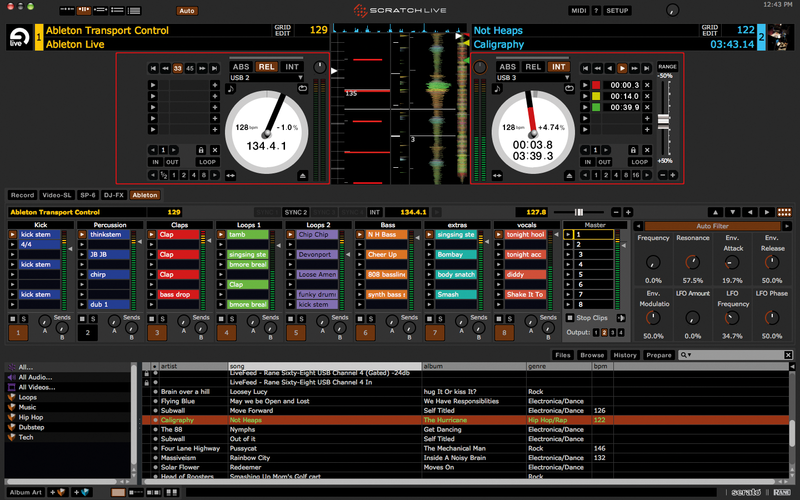 Let’s call da rewind to v8.2 and mention support for The Bridge, Serato’s DJ mixtape creation tool which now integrates with Live for access to the DAW’s effects, instruments and production tools, along with remote control of Live from Serato Scratch Live 2.1.1+. Suite 8.2 users, meanwhile, got a new toy in the shape of Amp, a guitar amp/cab simulator of similar, if less sophisticated, vein to IK Multimedia AmpliTube and Native Instruments Guitar Rig. v8.2.1 upped the performance and quantity of Amp’s presets, Drum Machines’ sound quality got a fresh lick of paint, as did many Rack presets and... go look at Live’s latest release notes for a detailed account of what's been afoot. This is, after all, MuzoBlog and not Ableton tech support. What does deserve pointing out is that v8.2.6 is a must if you’ve a Novation Impulse MIDI controller. 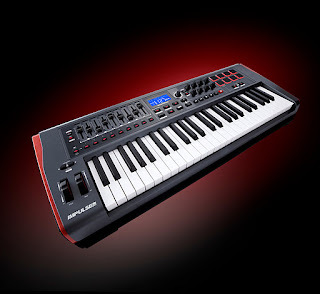 Impulses are pro-looking devices with semi-weighted, aftertouchable keyboards, plenty of control surface sliders, knobs and buttons, Novation’s very own, and very capable, Automap 4 software for slick control of your DAW and plugins, plus backlit pads for beat creation, warping arpeggios and launching clips, all designed with Live in mind. I must get on to the manufacturer, borrow one and put it through its paces, perhaps helping you decide whether to go for a Novation ZeRO SL Mk II controller, a Nocturn or an Impulse for your MIDI-control machinations. OK, what about this Retro Synths malarkey? At MuzoBlog, we likes freebies and this one looks a doozie. Founded in 2006, Puremagnetik is a company specializing in quality sound libraries for the likes of Native Instruments and, of course, Ableton. 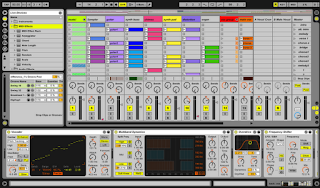 For some mad reason, those magnetik personalities at Pure are giving up a 2.16GigaByte .alp for all you registered Live/Suite 8 users to augment the already generous collection of offerings downloadable from Ableton’s free Live Packs page. However, I'll say it again: Get your Retros before the offer closes on October 31 - you’d be a drivelling dolt to miss it. Why? Because it's smashin’, that's why. In essence, Retro Synths is a collection of Puremagnetik’s loveliest classic analog and digital synthesizer emulations. Some 4,000-plus samples lie behind software incarnations of the Minimoog, Roland TB-303, ARP 2600, Doepfer Modular, Korg MS20, Roland D50, Casio CZ-1, Oberheim Matrix 6 and more. There's also Vector, rendering Live a production workstation awash with wave sequences, attack transients and vector morphing. The download is, as you'd expect from Ableton, a dot-alp file and, as we all know, that stands for Alphacam Laser Post, as used in the machine manufacture of wooden furniture. Oh, hang on... I think it’s Ableton Live Pack and the neat thing about .alps is that they're great for skiing holidays. I digress. Installation is the usual doddle - double-click on the file, Live launches and imports the content automatically. No messing with ‘Are you sure you want to install this?’ dialogs, or rooting through the OS’s file system to drag and drop a .dll or .component. Anyway, before I go into a rant about faddly installations, let’s get onto the second ‘buy-it-now’ exhortation. You may already be crazy about Steinberg Cubase which, like Live, is available for both OS X and Windows, but only accepts VST plugins. You could be loopy about Apple Logic Pro, which is OS X only and, in the absence of a plugin-conversion wrapper, only handles Audio Units. Or perhaps you’re potty about cross-platform Avid Pro Tools which, wrapperless, is limited to RTAS plugins. Then again, maybe you rave about Propellerheads’ Reason and Record, which don’t host plugins of any flavour. Well, Live is cross-platform too (OS X and Windows) and is rare in that it accepts both VST and AU plugins, so there are few disappointments when you discover that a must-have plug is only available for a platform you’re not using. Incidentally, sorry you Linux lovers - a dual-boot OS config is your only option. But why buy another DAW anyway? Because Live is a DAW that opens creative doors. As mentioned, such trad sequencers as Cubase, Logic and Pro Tools, as well as the more left-field Reason/Record duo, demand a considered approach to composition. With Live, you can load it and bash out something listenable from a clip collection straight off the cuff, which is great if you're seeking instant jollies and are averse to reaching for the Ritalin. There's also integration to consider. Yes, you could run Live on a dedicated computer and sync it to the main sequencer via MIDI. Then again, if you’ve a reasonably pokey processor, a 64-bit OS and your RAM runneth over, there's ReWire, Propellerhead Software's protocol for seamlessly integrating suitably equipped sequencers and instruments on one machine. Cubase, Logic and Pro Tools can all act as ReWire hosts, so it's possible to run Live simultaneously as a ReWire slave and have the best of both worlds a mere mouse-click betwixt. And if you’re running Reason, fret ye not. Live also functions as a ReWire host, so both will tick along happily in sync, giving you access to the strengths of each and an excellent excuse to deploy a secondary display - one for Live and one for Reason. I haven't delved deeply into Suite 8 in this post, and haven't even mentioned Max for Live until this point, partly because they deserve articles unto themselves and partly because I’m confidently expecting Live/Suite 9 to turn up in the not-too-distant. A few months ago, an Ableton marketing bod accidentally let slip of such a thing. ‘Twas either a typo, or our friends in Berlin are thinking way ahead of the game. Well, you've not the luxury of time. Get your Puremagnetik Retro Synth Live Pack before the month is out and then luxuriate in timbres of old while Live helps you whip up tunes anew in double-quick time.